Tile and bathrooms go hand-in-hand. It's a material that stands up well to moisture and offers endless design possibilities. At Flooring America of Scottsdale, we understand the pivotal role tile plays in many homes which is why, in addition to tile floors, we also install tile showers in Scottsdale, AZ. Stop by our showroom to get started. One of our sales associates will work with you to understand your unique needs, and then find the samples to match. 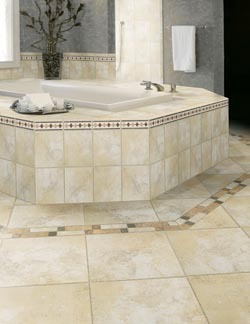 We have many types of custom tile shower options available in many sizes, colors, textures, and materials. Our designers are happy to help you design a motif that incorporates anything from ceramic subway tiles to colorful glass tile accents. They'll even show you what it will look like using computer imaging. This way, you'll be certain that's what you want. At our showroom, we take pride not only in our expansive selection of tiles, but also in our comprehensive list of services. In addition to providing the assistance you need to design your ideal shower and choose the right materials for the job, we also offer tile shower installation services. Our contractors are experienced, but more importantly, they're dedicated to perfection. They use efficient techniques during the installation process so you get the straight grout lines and perfectly placed porcelain, ceramic, or glass. The first step in your custom shower remodelling journey is visiting our sales and design staff. They'll help you understand which options are best for your needs and give you a clear picture of what the final results will look like so you can have complete confidence before you buy. The bathroom is one of the most critical rooms in the house. It's where you get ready from your day or relax with a warm bath after a rough week. That's why it's so important to design it in a way that makes you feel more relaxed. By installing a new tile shower, you get to personalize every small detail--and our designers are here to help make your vision come to life. We work with you to give you the inspiration you need. From small bursts of color to something more monochrome or subdued, we help you find the tiles that soothe your senses. Contact us today to learn more about our tile shower products. We proudly serve the communities of Scottsdale, Arizona, including McCormick Ranch, Gainey Ranch, Pinnacle Peak, and Grayhawk.